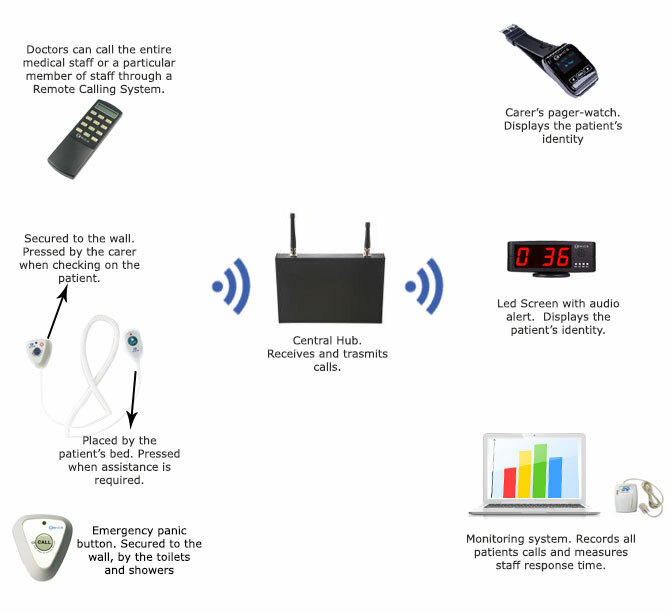 Our Nurse /Carer Wireless Calling System allows patients to alert care workers when they need assistance: the assigned nurse/career is instantly alerted via a pager-watch or LED Screen. When a patient needs assistance they simply press the calling button: this sends a signal identifying the patient to a pager-watch worn by the assigned nurse/carer, and to a wall mounted display at a supervisor station. Doctors can call the entire medical staff or a particular member of staff through a Remote Calling System. Nurses/carers also carry a Remote Caller, and without leaving the patient, they are able to call other carers/nurses and doctors for assistance; they can also use it to alert security staff in case of any patient’s aggressive behaviour (protecting staff is now part of risk assessment requirements as well as the Health and Safety legislation). Finally, reception can be alerted to call an ambulance (for nursing/care homes). The signal is also sent to our Nurse/Carer Monitoring System that records the patient’s identification, time of the call, the carer responsible and the time taken to respond. Our monitoring system then provides comprehensive reports for management evaluation. Simplicity and cost effectivness – extremely simple to operate and install with minimal running costs; the system can be easily expanded if required: units to be easily relocated to other departments/wards if necessary. it can be as small or as large as you want, as each nurse/carer wireless calling system is configured to suit your individual requirements. Increase service quality – patients calls are only sent to their designated carers. efficient, quick, and reliable communication throughout your organization; supervisors or carers can page specific staff members for assistance. when needed, doctors can easily communicate with nurses and caregivers and send assignments. Improve customer satisfaction – improve the quality of patients care through improved staff response time. doctors, nurses and caregivers can receive calling information promptly through a pager-watch and provide timely service: the work efficiency is increased greatly and consequently the overall customer satisfaction. Outstanding coverage range – doctors and nurses/carers can be easily reached no matter of their location. Reduce personnel costs – carers are only called when required, reducing the need for them to check on patients unnecessarily. one doctor, nurse or carer can take charge of several wards or hospital beds.